Macanudo Prince Phillip Maduro brings you warm and welcoming maduro character in a 7 1/2 x 49 Churchill vitola. Save even more on Macanudo Prince Phillip Maduro with this Special 2 Box Deal! Macanudo and Maduro are two words that go together like Jenny’s peas and carrots. What dark secrets only Macanudo knows about how to get the best out of Connecticut Broadleaf Maduro wrappers is a mystery; but the results are magical. As it burns the caramelization of the maduro wrapper’s abundant sugars and oils creates a sweet aroma. This is a very smooth and mild to medium cigar. Creamy mocha flavors hold consistent throughout accompanied by hints of cedar, honey, and mushrooms with a long pleasant finish. As a testament to Macanudo's usual high construction qualities, the burn was perfectly even to the end and the white ash held on for more than an inch before each drop. Of all the maduro’s I have smoked, the Prince Phillip is the smoothest, easy draw and a pleasing taste. A nice balanced size and priced right. 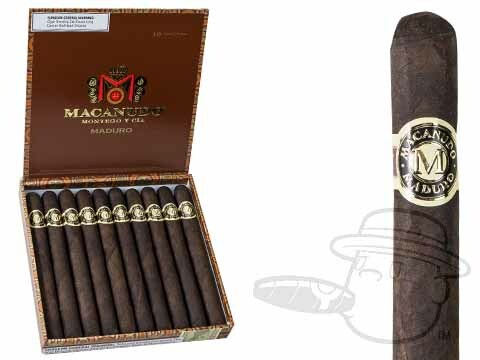 Macanudo Prince Phillip Maduro is rated 4.9 out of 5 based on 3 customer ratings.